The Carriage House was built c. 1806 by Captain Nathaniel Ingersoll as part of Green Hill, his estate in Brookline, Massachusetts. Ownership passed to John Gardner in the 1840's. In 1884 John L. “Jack” Gardner and his wife Isabella Stewart inherited the property. The Shirley-Eustis House Association acquired the Carriage House in 1999. The current structure is very similar to the original edifice, which was dismantled and reassembled. A large front portion boasts a clean enclosed coach room and a barn area at the rear shows were animals were once housed. A new lean-to contains handicapped accessible restroom facilities and a kitchenette. Not many carriage houses of this period have survived. As the nation adopted the automobile for transportation, carriage houses were demolished, burned down, or were converted to garages. The Ingersoll-Gardner Carriage House has the fine Greek Revival styling of the Federal Period. Richly ornamented with a pediment and two pilasters it resembles a c. 1867 sketch by W.C. Hunneman of the Shirley-Eustis stable once located to the left of the house. In that original configuration the earlier stable replicated a formal relationship between the structure and its entry sequence that was common to many estates. In the 1990's the original location of the Carriage House in Brookline was developed into several house lots, threatening the survival of the historic structure. Neither the Brookline Preservation Commission nor the Transportation Museum could raise funds rapidly enough to move it by mid-February 1999 in accordance with the new owners' wishes. The Shirley-Eustis House Association accepted the Carriage House as a gift from the buyers of the property at the end of December 1998 and began the process to move it immediately. 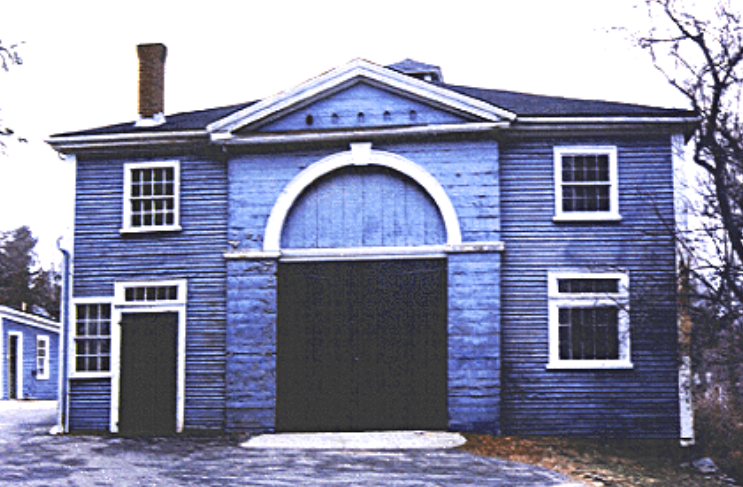 During January and February of 1999 the Carriage House was dismantled by Preservation Timber Framing, a Maine company experienced in moving historic structures. The building was carefully studied as it was taken apart and documented by photographs and video. Horse stalls and cow stanchions were found and preserved for re-installation. Each timber was given a metal tag and number. After all parts of the structure were temporarily stored in a Roxbury warehouse owned by a nearby vocational charter school, YouthBuild Boston, it was found that repairs to the frame and joists would require more work than originally estimated. Some parts were in unusable condition and had to be replaced, including several entire windows and doors. In October 2000, a groundbreaking ceremony marked the beginning of the reconstruction. At last, on May 16, 2001, then Mayor Thomas M. Menino and local community leaders participated in the dedication of the fully restored 1806 Ingersoll-Gardner Carriage House, culminating a two-year $500,000 project to bring the historic structure once more to use. Today, the 1806 Ingersoll-Gardner Carriage House is used for a wide-array of programs and events. From education programs to community events to wedding receptions, visitors get to enjoy the rustic interior of the beautifully restored Carriage House. On display in the carriage room includes a coach belonging to William Eustis that was originally at Shirley Place from 1820 to 1867. It was remarkably preserved and only one of about three in the country of this vintage in unrestored "pristine" condition according to Ken Wheeling of the Carriage Journal. Recently, the Eustis coach was fully restored. It is believed this was the vehicle sent to the Rhode Island border to pick up the Marquis de Lafayette when he came to visit Governor Eustis and to participate in the ceremony of laying the cornerstone for the Bunker Hill Monument in 1824. If you are interested in renting our beautiful Carriage House for a private event, please visit our Rentals page.